Mish's Global Economic Trend Analysis: Corporate Share Buybacks: How Timely Are They? Corporate Share Buybacks: How Timely Are They? 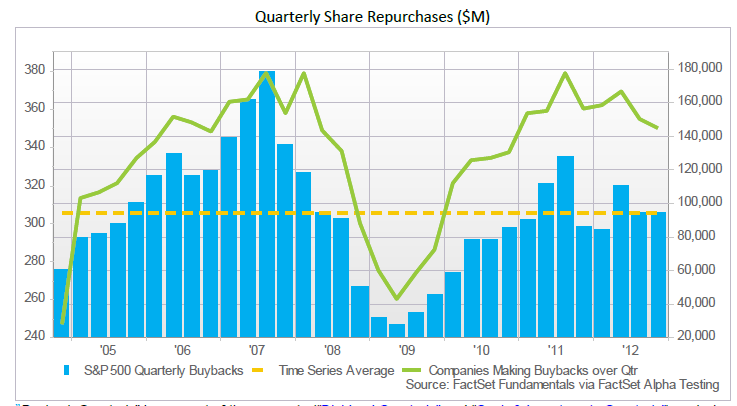 Factset Buyback Quarterly has an interesting series of charts and facts on corporate share buybacks. Here is my favorite chart in the series. Aggregate Buybacks: Dollar-value share repurchases amounted to $93.8 billion over the fourth quarter and $384.3 billion for 2012. The fourth quarter total is in-line with that of Q3, but represented year-over-year growth of 9.6%. Sector Trends: The Information Technology and Health Care sectors spent the most on quarterly repurchases ($19.8 billion and $14.4 billion, respectively) in Q4 2012. However, of the sectors that averaged $2 billion or more in quarterly share repurchases since 2005, the Industrials sector showed the largest sequential and year-over-year growth (30.6% and 59.4%) in dollar-value buybacks. Buyback Conviction: Dollar-value buybacks amounted to 79.1% of free cash flow on a trailing twelve month basis, which is the largest value since Q3 2008. The Consumer Discretionary and Consumer Staples sectors both spent more than 100% of their free cash flow (116.7% and 114.2%, respectively). The Energy and Utilities sectors spent $35.8 billion and $1.4 billion, respectively, on buybacks, despite generating negative free cash flow (-$25.7 billion and -$23.5 billion). The Consumer Discretionary sector also led all sectors in repurchasing the most shares relative to its size. Over the trailing twelve months, the sector repurchased shares that amounted to 4.5% of the sector’s average shares outstanding over the year. One look at the above chart is all it takes to see most shares are bought back at high prices rather than low prices. And check out the latest authorizations. Looking Forward: Program Announcements & Buyback Potential Going forward, several companies in the S&P 500 have authorized new programs or additions of $1 billion or more since December 31st, including Gap (GPS), Blackrock (BLK), Marathon Petroleum (MPC), L-3 Communications (LLL), Visa (V), Allstate (ALL), Moody’s (MCO), CBS Corporation (CBS), Dow Chemical (DOW), and AbbVie (ABBV). In addition, even larger authorizations were made by United Technologies Corp. (UTX), 3M Co. (MMM), and Lowe’s (LOW), which all announced replacement programs worth approximately $5.4 billion, $7.5 billion, and $5 billion, and Hess Corporation (HES), which announced a $4 billion buyback program on March 4th. Finally, a number of banks were approved to buy back large amounts of common and preferred shares in 2013. JPMorgan Chase (JPM) which was approved for $6 billion in share repurchases, Bank of America (BAC) was approved for $5 billion in share repurchases plus $5.5 billion in redemption of preferred shares, and Bank of New York Mellon (BK), U.S. Bancorp (USB), State Street Corp (STT), and American Express (AXP) were also approved to repurchase greater than $1 billion worth of shares. Why? Share prices certainly are not cheap. Much of the buybacks are in conjunction with massive shareholder dilution via stock option grants to executives. The executives continually unload their shares and corporations buy them back. Buybacks from the last two years generally look good, at least right now. But for how long? 2006 and 2007 buybacks looked good too, up until the crash. Is this yet another case of "here we go again?"